With a taskforce of FBI Agents and Metro Detectives investigating an alleged scam that may have raked in hundreds of millions of dollars, you might think the chief suspects would lay low or get out of town. That is not the case regarding one very large homeowner association which, in just the past few weeks, saw the same suspects return for another bite of the apple. Wanda Murray is amazed at the brazen return of the same outfit that has already taken millions of dollars out of the Vistana condo complex. In late December, she says the property manager informed her that $450,000 had disappeared from the homeowner association's bank account -- the last of an $8 million fund set aside to repair construction defects. "They just went and did it," she said. serve search warrants at several locations. At the center of the probe is Silver Lining Construction, owned by Leon Benzer. His office was searched along with that of his close associate, attorney Nancy Quon. The offices of a homeowner association management company called Platinum were also searched. Lawmen believe that Benzer and others initiated the takeover of homeowner association boards all over town, possibly through rigged elections. The Benzer-dominated boards then voted to file construction defects lawsuits, which often were handed to lawyer Quon who succeeded in landing huge settlements. The lucrative repair work then was given to Benzer's company. In the case of Vistana, Murray and others say all five members of the board were tied to Benzer. The property had numerous defects -- electrical problems, mold -- serious stuff. Quon won a $19 million settlement, but $11 million of that went to the lawyers. $8 million was left over to fix Vistana. That money is now gone yet the problems remain. "Where did the money go? Right straight to Leon Benzer's attorneys account," said Murray. "He hasn't done one iota of what was supposed to be done. He did patchwork. He did band aids on stuff." performed some work, mostly cosmetic, worth atmost $500,000. But the problems that really needed fixing are still there. Silver Lining was to remove 200 palm trees that were growing right into the buildings. The trees are still there. Walkways were not level, pouring water into homes. Benzer's solution was to cover them with a pink coating, material that has already cracked and peeled into an even bigger mess. Everywhere you look in Vistana, there are problems that haven't been fixed, but in December, after the investigation was well known, Benzer's attorney filed a legal action to claim the remaining $750,000 in the Vistana defect account saying it was owed to Benzer for the work he did. The homeowners had no intention of paying, but then were told two board members, men suspected of working for Benzer, had gone behind everyone's back and snagged the money. "They went to the bank and handwrote a countercheck -- wrote in our name and account number and Wachovia cashed it," said Murray. Why did Wachovia cash a check from two HOA board members who did not have the authority to write it and have not attended a board meeting since news of the FBI probe broke? 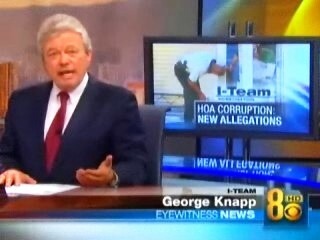 The bank declined to speak with the I-Team. The new attorney for Vistana's HOA says he had an agreement with the bank that this could not happen, but somehow it did. He intends to sue. 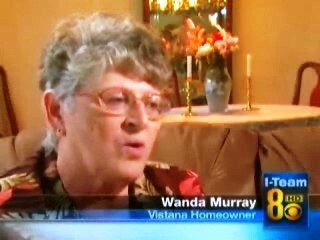 Wanda Murray and the other homeowners think there's a reason the suspects would pull something like this, "They don't believe they are going to be caught." Homeowners say state law makes it almost impossible to remove the two board members who pulled this off, "You need to have 35-percent of the homeowners fill out that ballot to recall a board, but we can't get that many homeowners. They're out of state. They're investors who never see the paperwork anyway." About 65-percent of the Vistana condos are owned by nonresidents. The only time the HOA has ever seen more than 35-percent of residents vote on anything is when the suspicious board members were elected, but they suspect those elections were rigged through ballot stuffing. Law enforcement will not comment on the status of the ongoing investigation, though the I-Team believes the probe is very active and that investigators are very aware of this latest incident.